Complementing my daily blog interviews, today’s Author Spotlight, the one hundred and twentieth, is of historical novelist Janet Kay. Janet Kay has had a number of articles, short stories and poems published over the years. She published her debut novel, Waters of the Dancing Sky, in 2009. It is an inspirational love story set on the wilderness islands of Rainy Lake, Minnesota. This novel continues to earn excellent reviews and has a five-star rating on Amazon.com. I decided at the age of eight that I would be an author someday. I wanted to write novels that would make a difference. However, life got in the way of my lofty ambitions – things like my career and raising my children. While I published a number of articles, short stories and poems over the years, it wasn’t until I took an early retirement that I was finally able to pursue my lifelong dream. I published my debut novel, Waters of the Dancing Sky, in 2009. It is an inspirational love story set on the wilderness islands of Rainy Lake, Minnesota. This novel continues to earn excellent reviews and has a five-star rating on Amazon.com. Drawn to an old cemetery in the mountains, she discovers a weathered tombstone and begins to sob uncontrollably. 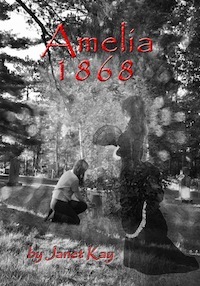 Only two words are etched upon this stone – AMELIA 1868. Obsessed with uncovering the identity of this long-forgotten woman, Rose finds herself transported back and forth in time between the life of a hurdy-gurdy dance hall girl struggling to survive in the 1860s and her own sheltered life in 2011. Her strange and intriguing journey becomes more complicated when a love interest materializes and throws her off balance. Her life becomes a bizarre dance twisting and turning between the past and the present. Can she find a way to move into the future? 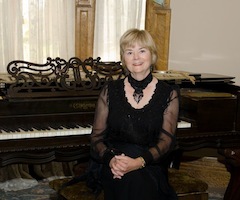 My website, http://www.novelsbyjanetkay.com, contains more information about my novels, a photo gallery, and a contest I’m sponsoring to promote my books. Please check it out – I’d love to hear from you! Janet knew aged eight that she wanted to be an author… it took me another 30 years. 🙂 You can find more about Janet and her writing via her website, http://www.novelsbyjanetkay.com, contains more information about her novels, a photo gallery, and a contest she is sponsoring to promote her books. The blog interviews will return as normal tomorrow with historical romance / paranormal romance author Deniz Bevan – the four hundred and ninety-fourth of my blog interviews with novelists, poets, short story authors, biographers, agents, publishers and more. A list of interviewees (blogged and scheduled) can be found here. If you like what you read, please do go and investigate further. And I enjoy hearing from readers of my blog; do either leave a comment on the relevant interview (the interviewees love to hear from you too!) and / or email me.